There are only three questions the employer really has to answer during the selection process: Firstly, do you have the right skills and experience? Secondly, do you have the required enthusiasm and motivation? Finally, are you going to fit in, in terms of your personality, attitude and general work style? Personality has a significant role to play in providing answers to the second and third of these questions. In most working situations it’s the personality of your co-workers and managers that affect the day-to-day success of the organization. If the team doesn't work well together or a manager can’t motivate their staff, then productivity and quality of service will suffer. The way that most organizations operate has also changed in the last 30 years. 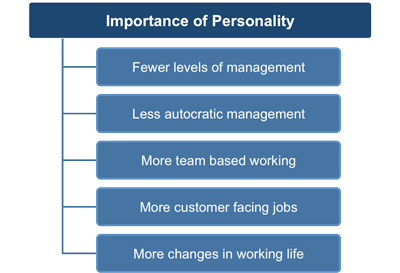 There are usually fewer levels of management than there were and management styles tend to be less autocratic. In addition, the move in the western world at least, towards more knowledge based and customer focused jobs means that individuals have more autonomy even at fairly low levels within organizations. The effects of these changes means that your personality is seen by a potential employer as more important now than it was in the past. In 2009, personality testing is $500 million industry which has been expanding by about 10% per year. There are currently well over 2,500 personality questionnaires on the market and each year dozens of new companies appear with their own ‘new’ products. Some of these products are broad-spectrum tests designed to classify basic personality types, some are designed to test candidates for suitability for a particular job and some are designed to test for particular traits – for example, honesty and integrity. There is a historical association with academic and occupational psychology which gives the personality testing industry a degree of credibility that it does not always deserve. Many of the well established companies who provide personality tests do operate to the highest ethical and professional standards. However, it is inevitable that such a growth industry with low barriers to entry and little official regulation has attracted entrants with varying degrees of competence and integrity. This situation is made more difficult since most of the companies that produce personality tests are very secretive about their methodologies and refuse to make public crucial information about how their tests were developed or how well they work, claiming that this information is ‘proprietary’. The usefulness and accuracy of even the most well established tests, (for example, the Myers-Briggs Type Indicator - first published in 1962 and the subject of thousands of research papers), remain highly controversial among psychologists. For more information on this topic see - Personality Tests - Understanding the Industry. The Myers-Briggs Type Indicator (MBTI) - assessment is a personality test designed to measure preferences in how people see the world and make decisions. The MBTI was originally developed in the 1940’s by Katharine Cook Briggs and her daughter, Isabel Briggs Myers, who thought that an understanding of personality preferences would help women who were entering the workforce for the first time to identify the sort of war-time jobs which would suit them best. By the early 1960’s, the initial questionnaire had become refined into the MBTI. The MBTI uses a series of forced choice questions in which the individual has to choose only one of two possible answers to each question. The choices are a mixture of word pairs and short statements and are chosen to reflect opposite preferences. Participants may skip questions if they feel they are unable to choose. The current North American English version of the MBTI includes 93 forced choice questions and there are 88 questions in the European English version. The SHL OPQ32r - This test measures aspects of behaviour that are crucial to performance potential, which cannot easily be identified by other techniques, such as reading CVs and interviewing. The OPQ32r provides a clear, simple framework for understanding the impact of personality on job performance. The OPQ32r is available in more than 30 languages and is administered online. The questionnaire takes the majority of people less than 30 minutes to complete and a range of reports are available, providing clear, concise, graphical summaries of performance against job competencies. Most of these reports are designed for use by line managers. Results can be processed immediately with no human input. The test administration software can produce very detailed and impressive looking reports. See Example.